I need to do form input validation on a series of EditTexts. I'm using OnFocusChangeListeners to trigger the validation after the user types into each one, but this doesn't behave as desired for the last EditText. If I click on the "Done" button while typing into the final EditText then the InputMethod is disconnected, but technically focus is never lost on the EditText (and so validation never occurs). Should I be monitoring when the InputMethod unbinds from each EditText rather than when focus changes? If so, how? Why don't you use TextWatcher ? EDIT: For a cleaner approach refer to Christopher Perry's answer below. You can add these annotations to your UI widget references and perform validations. It also allows you to perform validations asynchronously which is ideal for situations such as checking for unique username from a remote server. There is a example on the project home page on how to use annotations. You can also read the associated blog post where I have written sample codes on how to write custom rules for validations. Here is a simple example that depicts the usage of the library. The library is extendable, you can write your own rules by extending the Rule class. Google has recently launched design support library and there is one component called TextInputLayout and it supports showing an error via setErrorEnabled(boolean) and setError(CharSequence). I have created an example over my Github repository, checkout the example if you wish to! I find InputFilter to be more appropriate to validate text inputs on android. Here's a simple example: How do I use InputFilter to limit characters in an EditText in Android? You could add a Toast to feedback the user about your restrictions. Also check the android:inputType tag out. I wrote a class that extends EditText which supports natively some validation methods and is actually very flexible. Note, you must not have any spaces inside "numberSigned|numberDecimal". For example: "numberSigned | numberDecimal" won't work. I'm not sure why. // EditText are going to appear with an exclamation mark and an explicative message. personName: checks if the entered text is a person first or last name. personFullName: checks if the entered value is a complete full name. nocheck: It does not check anything except the emptyness of the field. You can put the following attrubute to validate only alphabatics character can accept in edittext. 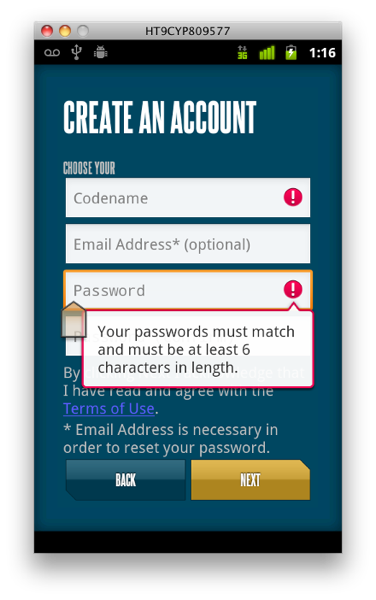 You can get desired behavior by listening when user hit "Done" button on keyboard, also checkout other tips about working with EditText in my post "Android form validation - the right way"
app:setRegexErrorMsg="Is that really your age :D?" How do I use InputFilter to limit characters in an EditText in Android? What android:inputType should I use for entering an IP Address? Android : How to set acceptable numbers and characters in EditText?